Fancy escaping from Wellington for the day? Then bring the family, head over the hills to Carterton in the Wairarapa and join in the fun at the BIG BOOK BASH on Saturday 2nd December. The Big Book Bash has something for everyone, with fun activities, readings, storytelling, workshops, book sales and signings, performances and more. Some of highlights include zine making with Murtle Chickpea, paper bag dogs with Fifi Colston, creative writing workshop with Mandy Hagar, Rainbow Storytimes with LaQuisha St Redfern and Pamela Hancock, author talks and readings with Juliette McIver, Paul Beavis, Allan Bagnall, Ali Foster, Anne Manchester, Mary MaCallum and so much more. With over 30+ events on offer and some amazing authors and illustrators to inspire and delight you this will be a day to be remembered and the best bit, it’s all FREE! While you’re there perusing the offerings keep an eye out for the Wellington City Libraries’ stand where we will be running a Scavenger Hunt with a bag full of books for the prize! Race Relations Day, 21 March, marks the International Day for the Elimination of Racial Discrimination, which is celebrated around the world. Wellington City Libraries is a proud participant in the Diversity in Action Programme facilitated by the Human Rights Commission. The New Zealand Diversity Action Programme is a community initiative. It began in 2004, in response to the outrage at the desecration of Jewish community gravesites in Wellington. The programme has been active in promoting and encouraging positive race relations. 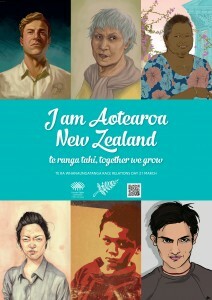 The 2014 theme in New Zealand is “I am Aotearoa New Zealand…te ranga tahi, together we grow.” This year’s poster features portraits from six of New Zealand’s top illustrators (clockwise from top left): Max Thompson, Rebecca Kereopa, Rebecca Terborg, Angus Gomes, Donna Cross and Henrietta Harris. This year we are celebrating Race Relations Day with a free author talk – in conversation with Samson Sahele and Adrienne Jansen. These two very different writers will cast their eye on New Zealand’s multicultural society and talk about their own work and about writing together. They will be joined by refugee youth who will read poems from Walking with a Fragile Heart. This is a free event and will be held at the Wellington Central Library, Thursday 20 March 6-7 pm. Well known musician Sam Manzanza will play the drum at the beginning of this session calling you all to attend! Pencil this in your diary now! Next post I will tell you more about the authors.